Dan Mundy & Gary Eck, circa 2000. 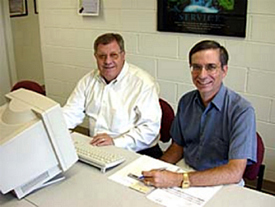 Eck-Mundy Associates was founded by Dan Mundy and Gary Eck, PE. We are members of the Jasper Chamber of Commerce, Huntingburg Chamber of Commerce, Ferdinand Chamber of Commerce, Perry County Chamber of Commerce and Spencer County Chamber of Commerce.